Glowing reviews of David Byrne’s ‘American Utopia’ tour have been coming from around the world and it is something a bit special. 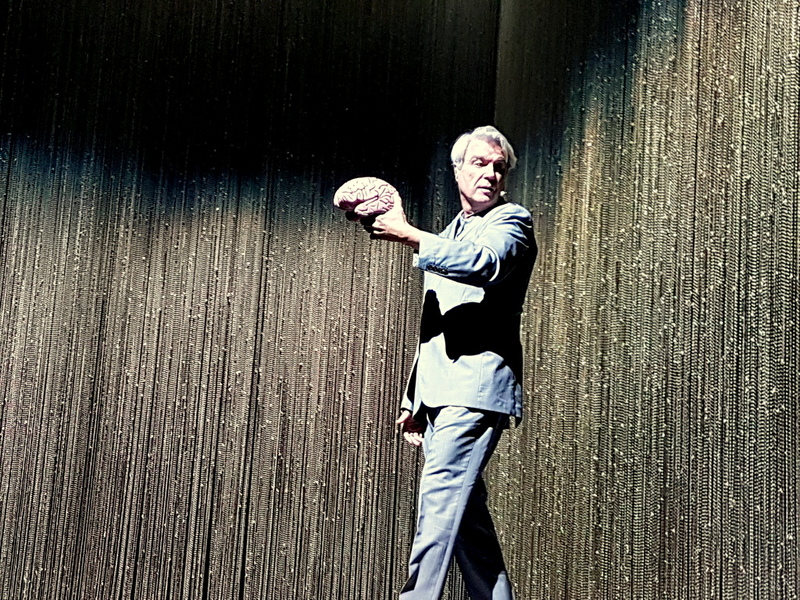 Byrne is known for his live performances, with the Talking Heads’ 1984 tour film ‘Stop Making Sense‘, directed by Jonathan Demme no less, going down in history. The film is widely said to be the best film of a live performance ever. This tour was described by Byrne as his most ambitious show since Stop Making Sense and may even challenge its title when the inevitable dvd is released! The tour has freed the musicians, with all twelve of the performers moving and dancing around the stage. While it is technically difficult for guitars and keyboards to be free of cables, the biggest challenge was the drum kit. To achieve this they descronstructed the kit entirely! There were six percussionists on stage, all playing drums strapped to their waist or handheld. The musicians (including Byrne himself) all performed in grey suits and matching shirts while bare foot, to add to the striking visual. The stage was surrounded on three sides by a shimmering silver string curtain, creating a simple space in which the band operates. The production also features the work of choreographer Annie B Parson, who controls the movement of the various band members, and in truth it is closer to a piece of dance theatre than it is a traditional rock show. The players weave, dance and move around the stage in perfect timing while playing their various instruments. In the few moments David talked to the audience, he seemed confused on the origin of the venue, asking was it once called the Point. In an age where venues change their names depending on the willingness of a sponsor to pay big money, he shouldn’t have been surprised! He also seemed keen to prove that all the music heard was being played live on stage as various journalists had questioned whether backing tracks were involved. Thankfully, every sound heard was created on stage! The only minor quibble would be the set list. While he did reach back for classics such as Burning Down the House, Once in a Lifetime and Road to Nowhere, the show focused on the new album which while enjoyable does not dazzle like so many of his earlier works. The set did include some of his recent hits including I Should Watch TV (David Byrne & St. Vincent cover) and Toe Jam. This was an extremely inventive production that would put energy and life into any live performance. I can see many artists trying to follow suit and match the style and imagination of the production. 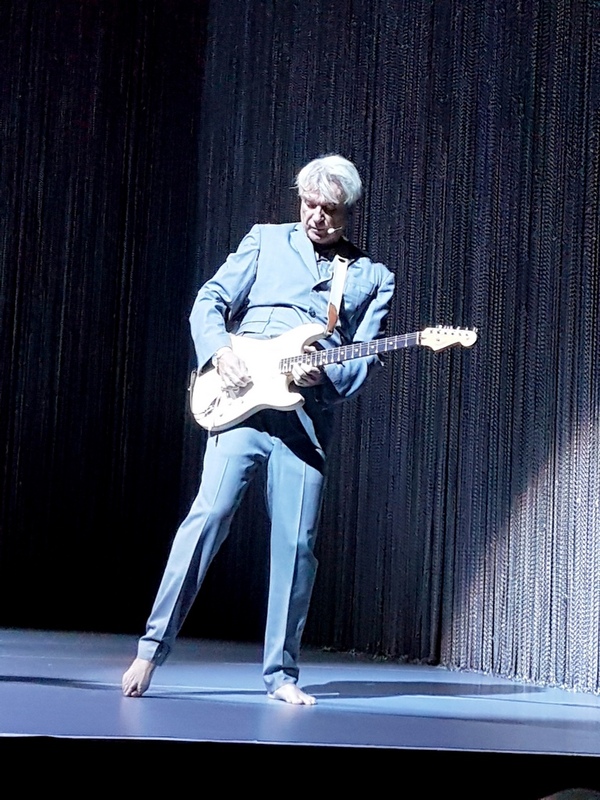 David Byrne is now 66 years old and it is hard to believe when you see him dancing with the other performers on stage. He would put many musicians half his age to shame! A night to be remembered from one of the most important artists of our age.